Seven 2011 Editors’Choice Awards granted to PrimaLuna… Yes this is the BIG one! 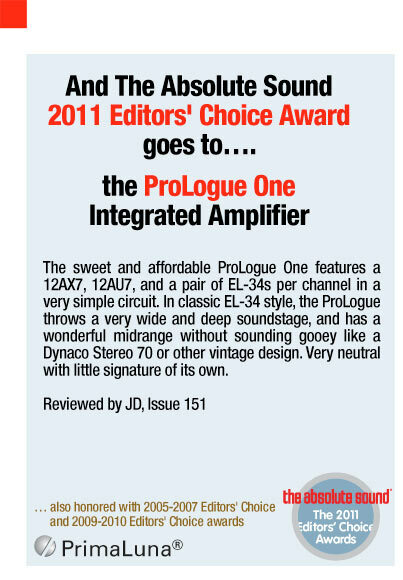 Welcome to the 2011 edition of The Absolute Sound’s Editors’ Choice Awards, the annual Recommended Products list. These are the components The Absolute Sound Editors themselves would buy – or recommend to friends and family. PrimaLuna scores again and get 7 awards. In the coming days, we will introduce you to each awarded product. 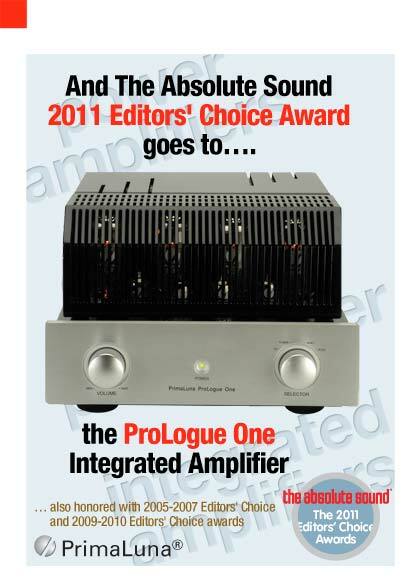 The ProLogue Original One integrated amplifier gets its 8th awards in 6 years time. 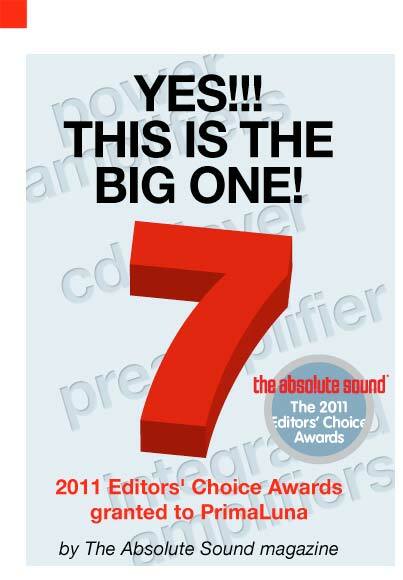 6 Responses to Seven 2011 Editors’Choice Awards granted to PrimaLuna… Yes this is the BIG one! Congratulations PrimaLuna team with this -well deserved- rain off awards! And to you! Dank, Merci, Grazi, Thanks, Grazia, Danke! I am happy my prologue One get a reward again this Year. When you use this amplifire every day you are every time again surprised that he sound so fantastic. Thank YOU for sharing with us and other readers your enthousiasm about our PrimaLuna products. Keep on listening. congratulations, as a proud owner of a PL2 i am right behind you! Thanks James! It starts to become a “birthday-feeeling” to get these Awards every year. I am not such a “birthday-guy”, but these I like very much :-).